WOW WOW WOW!!! The total solar eclipse yesterday was AMAZING! We had the privilege of being in the path of totality and I am super excited that I was able to capture it on camera! What I forgot to photograph, though, was how dark it got (bummer!). But capturing the eclipse was super exciting, so I’ll be ok, haha. Are you ready?! OK! Here is what WE saw today! I had to adjust my camera settings when I first started so this is where I started getting decent shots, lol. Totality!!! How awesome is that?! Diamond effect. I missed the first one, so I’m glad I got this one! So cool! So what about YOU? Where were you for the eclipse? Did you have a clear view? How did you feel about seeing a total solar eclipse? Author The Rutherford AdventuresPosted on August 22, 2017 September 3, 2017 Categories UncategorizedLeave a comment on Lights Out! Plans don’t always go as we want, it’s taken longer than we had hoped to get to the Canada border and by the time we made it to the border, it was too late. The fires in Canada and Yukon had spread too far west and the roads we would have taken were closed. It’s a bummer, of course, but we do our best to stay positive and look forward to our next adventures, like visiting Yellowstone! We had such a great time visiting the different areas of the park that we didn’t get to see a few years ago when we drove through briefly on our way to visit family. Our last visit, we got to see a heard of bison (up close and in the safety of our van!) and even saw a HUGE porcupine (my first time seeing one in person). This time we didn’t get to see bison, or porcupines, lol, but we saw plenty of raven’s. Did you know, they like to sneak in and take things when you turn your back?? Lol. One ranger told us a few experiences, including one where another ranger’s radio was taken from him by a raven! And a man lost his wallet to a raven? Sneaky little things, aren’t they?? So funny! We look forward to our upcoming adventures and also the day we get to fulfill our dream of visiting beautiful Alaska. And of course, we are SO looking forward to the total solar eclipse this morning! More to come! Visit again soon, I’ll be adding photos! To catch up, after we visited homebase for a couple weeks (back in January) we made our way west to Mississippi, visited awesome new friends in Louisiana (one of which taught me some cool soap making tricks and spoiled me with soap goodies! We then made our way to Texas and hubby found the man that brought him into the world. This wonderful man is 101 years young and still going strong. He and his wife are one of the sweetest couples you could ever meet. Also in Texas, we met another soap making friend, and swapped more soap goodies, haha. After Texas we showed the kids the house my family lived in in New Mexico as I was growing up, had fun sliding down the dunes of White Sands, visited old friends, and got to explore Carlsbad Caverns (another childhood experience I had that we got to share with the kids). We spent some time visiting new friends in Arizona and explored the area (more about that later!) then headed to Mexico for a weekend which was a blast, the food and view was amazing! On to California! So much in California, lol. We then made our way up to Oregon, Washington (more on this later as well), then Idaho. We were just in Yellowstone and are now waiting to observe the solar eclipse, we’re so excited! More updates to come, lots of catching up to do! Author The Rutherford AdventuresPosted on August 18, 2017 Categories UncategorizedLeave a comment on Time Sure Flies! We had a great time at the National Naval Aviation Museum in Pensacola, Florida back in November. A dear friend took us and I must say, I’m not normally into this type of museum, but I was quite impressed. There was SO much to see! The kids had a blast looking at the large variety of planes, sitting in the captain seats and the IMAX movie about The Blue Angels. On a side note, as we were leaving, my hubby and I managed to get separated and I got lost, haha. As soon as I was found, I was kindly escorted to the front by a nice young man in uniform. Although they were very understanding of my situation, I would highly suggest giving yourself plenty of time to find the exit if you plan on visiting. Ha! I would definitely recommend this museum. The kids had a great time and there was a LOT to see. I’m back! We are still on the road, and doing well. I had to take time away to recover from some last minute dental surgery and some unexpected health issues. Now then! We have been busy, we are now in New Mexico! I will be updating from where I left off and I so appreciate everyone’s patience and continued interest in our travels. A nice little park in the town of Jal. Enjoyed our 3 nights here with a little fishing and playground fun. Hope y’all are doing well! Are you a fellow traveler? What was the last state you enjoyed? Author The Rutherford AdventuresPosted on March 5, 2017 Categories UncategorizedLeave a comment on Checking In! Our first week heading back out started out interesting. We made plans well in advance with different friends along our route, yet, once we got to the first one on the list for this month, it turned out they cancelled their plans, without letting us know. So we stayed overnight at a nearby Wal-Mart, then called the next friend to see if we could come a week early. Got a call back the next morning that where they were going to have us stay wouldn’t work out afterall…. So we moved along and another night at another Wal-Mart. We called the next friend, another cancel. And yet another Wal-Mart. By now we’re quite disappointed, as you could imagine. That first week had been pretty chilly at night, but thankfully we stayed warm enough. Plenty of blankets and snuggles. The Walmart we stayed at before parking at the couple’s home. So, we made our way to another town with friends we know and haven’t seen in a while. They didn’t know we were coming, so of course another night at another Wal-Mart BUT by the next morning they had found us a spot, and good timing too because it got COLD. We were able to hook up and got to run our heater. There was a little mix up, though, but our friends worked it out and got us not only set up in a quieter spot but our hosts insisted we stay in the apartment they have at their house. Quite unexpected but deeply appreciated. We really enjoyed their hospitality. The wife used to teach music so she taught our kids songs on the piano during our stay, they had a BLAST. Aaand, I got to enjoy a good water pressure shower, haha. If you full-time or have ever stayed in a camper, you know what I’m talking about! 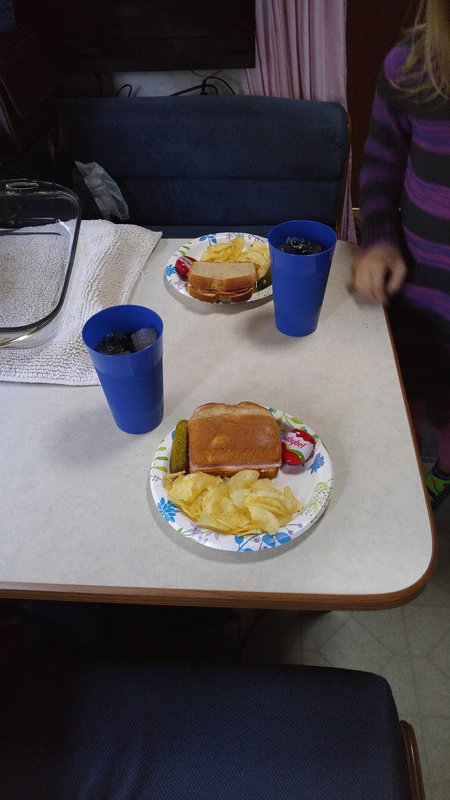 Our kids made us lunch one day. Aww. So, this USED to be my favorite wool sweater. I made a big mistake… LOL. It now fits my 8 year old perfectly. One thing I found in this town was a little store called Dirt Cheap. If you ever come across one of these stores, you should check it out. I will advise to carefully check each item before buying though, some items are “dirt cheap” for a reason, lol. But I did get several good finds for under $7! If you like coffee and M&M’s then you need to try these, MMMM! Found at…. you guessed it, Walmart! Ha. My first sweet potato casserole in our Instant Pot. So after a week and weekend with this wonderful couple and visiting our friends in the same town and working in the ministry with them, we moved on to our next destination, a week early…. I love reminiscing, don’t you? Our cousins took us on a hike during our visit and it was beautiful! The drive there was beautiful in itself. There were maple trees the whole way, with bright shades of yellow, orange and reds. If you’ve ever seen maple trees changing in the fall, you know what I’m talking about. And if you love nature as I do, you get excited to see such beauty. It’s the small things in life that truly make life enjoyable, wouldn’t you agree? The trails were really fun. Thankfully, hubby was having a good day and the trails weren’t too steep, though I myself got a little out of breath, lol. It was a great reminder that I need to get more active and exercise more, ha! But it was so worth it! I’m sure the waterfall has different water levels during different parts of the year but it was beautiful nonetheless. We all, but one cousin, wore our sneakers and had to be careful where to step so as not to soak our shoes but it was low enough we were able to do so. I LOVED this view, isn’t it beautiful! If you’re looking to get great shots, you may have to wait your turn, lol. There were a few other visitors taking photos and as patient as I try to be, I think it would be courteous to sit and look through your shots where you’re out of the way, right? But I finally got my clear shots and was happy to move along myself, lol. It was quite a peaceful experience, not too many people passing by. I definitely look forward to going back to this spot. First time I ever got down on the ground for a shot, lol. Ok, so I’m new at photography and hopefully these weren’t over edited, lol. I’m always open to suggestions! This was an awesome spot to practice!